Vertical-type scribing machine - SHIRAI TECH, LIMITED. 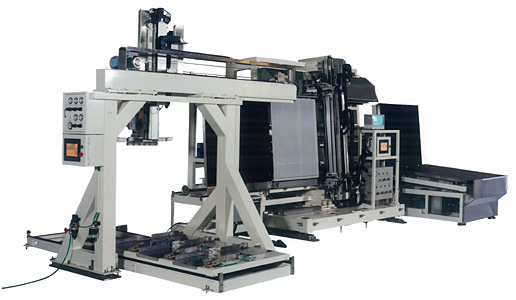 This FPD-coated mother glass cutting and breaking machine has been designed to stand upright to prevent glass cullets from adhering to the processed glass surface (which may decrease the efficiency of the production line). This can also be connected to the vertical-type edge grinding machine and incorporated into the production line. For large-sized panels, the loader will be a robot-type, with automatic glass pick-up and paper removing operations.